When playing a video game, be it at home or in a competition, you need to ensure that you have a screen that does justice to the graphics the game has to offer. To enjoy the game to the fullest, you require a great monitor. For this purpose, the ASUS ROG SWIFT PG279Q gaming monitor is one of the best ones that offer various features to ensure a great gaming experience. Beginning with the ASUS ROG SWIFT PG279Q gaming monitor review, this 27-inch monitor comes with a QuadHD display with a 1440p resolution and an additional bezel design. These two features ensure that the screen gives the users a clear resolution and a good screen size, which ensure that you have a remarkable gaming experience and the graphics of the game are given justice. It also comes with a few different input outlets from which you can attach different hardware. These include the likes of an earphone jack, display port, HDMI and USB ports, and a mini jack which allow you to connect various devices at the same time. The monitor has an incredible refresh rate which ensures that you witness the best of the graphics that any video game has to offer. The barrier of 144Hz has been broken by this screen as it offers a refresh rate of 165Hz, which ensures that the user can see smooth graphics and enjoy their gaming session to the fullest. One of the greatest parts of the screen is that it offers six different gaming modes with an IPS panel display. Be it racing, scenery, cinema, FPS, RTS, RPG or sRGB, you can run all these different modes on the screen and enjoy the game to the fullest. The monitor also includes Nvidia’s G-Sync technology along with PG279Q ROG Swift which delivers the best gaming experience you can imagine. These technologies make sure that you get a fast, astounding and awe-inspiring gaming session that you can ever want. The best in the market, this monitor ensures that you get to experience one of the finest gaming sessions with incredible and top quality display. The monitor is durable and reliable and can easily be adjusted according to the needs of the user. The screen is the perfect size, which allows the user to witness one of the clearest and most exceptional image qualities. 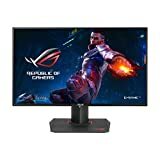 It is one of those monitors that has received some of the best customer reviews and is viewed as one of the best monitors to use for gaming sessions. The performance of the quality is up to par with any gamer’s expectations and is the best you can use. The ASUS ROG SWIFT PG279Q is a fantastic gaming monitor developed by a well respected brand, with eye care technology and a very high refresh rate it provides the ultimate gaming experience. The price range is fairly affordable as far as gaming monitors go, therefore we can only suggest this monitor to our friends with confidence.